What up movie lovers! Last year I ranked most of the main nominee categories for the Oscars and with that time of year here again, I’m right back at it. Of course I can only rank a category if I’ve seen all of the performances and in the case of the actor in a supporting role category, I have! Most of you may know that there is a lot of controversy surrounding the Oscars at the moment and while I do acknowledge that there is a problem, I think as movie fans we should be celebrating the movie world instead of focusing on the negativity. With that being said, these ranking articles I will be putting out in the coming weeks are solely here to rank the nominees without commenting on the current controversy. With that out of the way, let’s begin. Like most recent years, the performances have been really strong this year and that is the case with this category. An argument can be made that best actor in a supporting role is the category that doesn’t have a clear-cut one or two favorites but rather an opening for any of the five actors to take the award home. 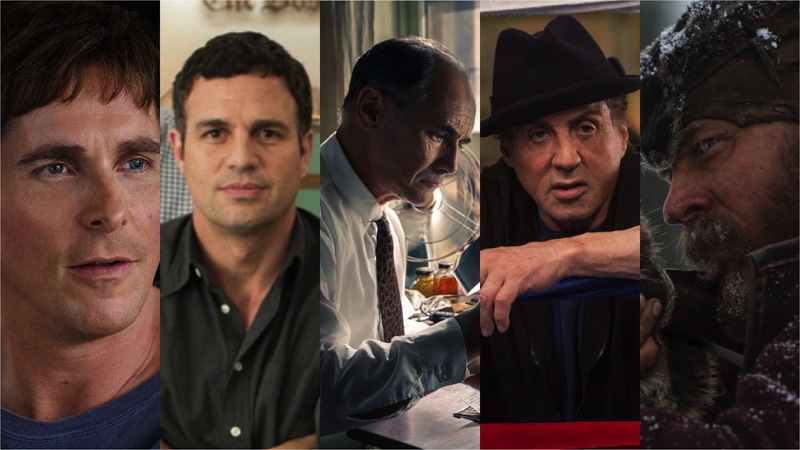 For those who don’t know, the nominees for actor is a supporting role are as follows; Christian Bale (The Big Short), Mark Ruffalo (Spotlight), Mark Rylance (Bridge of Spies), Sylvester Stallone (Creed) and Tom Hardy (The Revenant). Now keep in mind that these rankings are simply my personal opinion, not what I think the academy voters feel are the best. So let’s get to it! Just because someone is last on my list doesn’t mean that they didn’t give a great performance. Bale was really good in The Big Short but I happen to think his performance is the weakest of the bunch. There are even a few names I would put on this list instead of his, such as Jason Mitchell in Straight Outta Compton or Jeff Daniels in Steve Jobs. However, the Academy voters love them some Christian Bale and given the acclaimed film he was in, the good performance he gave and his name, he had everything going for him to get a nomination. I said earlier that all five of the nominees have a chance to win this category and if I had to choose an odd man out, it would definitely be Bale. I’ve heard around the web that Mark Rylance might be the favorite to win this category and while I do think he was great in Bridge of Spies, I disagree with that. However, I will not be upset if does win. He’s definitely a worthy candidate and maybe the most memorable character in the movie. I just didn’t leave the theater after seeing Bridge of Spies thinking “Wow, that dude has to get nominated for an Oscar.” Still, I do acknowledge that he gave a really solid performance and is deserving of the nomination. Stallone is definitely the fan favorite to win the award and I personally would be really happy to see him take it home. However, in my unbiased opinion I do not think he gave the best male supporting performance of the year. Definitely one of the best though and I would be a little upset if he didn’t get the nomination but I think getting the nomination alone is a huge victory for Stallone and the movie. If the Golden Globes are any indication on who will win the Academy Award, which they typically are not, then Stallone might just pull it out. Ranking these last two was very difficult for me but I ultimately had to make a decision. Tom Hardy is a guy who is going to be in the Oscar race many more times for the rest of his career and what a way to kick it off with his performance in The Revenant. He arguably steals the movie from DiCaprio which is saying a lot since Leo is probably the favorite to win best lead actor this year. Hardy played the role of Fitzgerald so damn well as he was intense and really terrifying to watch. I would not be surprised at all if Tom Hardy takes the gold home. This is the performance on this list that absolutely blew me away. I left the theater raving about this movie in general but specifically about the performance of Mark Ruffalo. This is the second year in a row that Ruffalo has been nominated for the best supporting category and while I don’t think he had a chance to win last year, he definitely has a chance this year and in my opinion he should win. There is a scene in the film (which the picture above is taken from) where his character loses it and explodes! This is the scene that took his performance from really good to phenomenal and without this scene I would probably say Hardy gave the better performance. It just goes to show how much one moment in a movie can impact it and the overall performance of the actor(s) involved. Ruffalo is definitely one of my favorite actors working today and I truly believe he deserves to take the Oscar home this year. Well there you have it, my rankings for the best supporting actor category for this year. It’s a strong year and only one can win, hopefully it is one of the top guys that I chose. How about you all? Do you agree with my list? Let me know how you would rank these performances in the comment section! Yea I would be happy if either one took it home! Mark is a good actor!